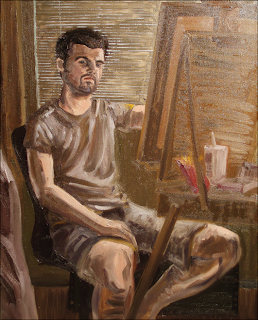 Here's a self-portrait I just finished for my portrait painting class (and yes, that is McDonald's food sitting on my easel). I decided to go very expressive (and chunky) with it. You can't really tell in the full sized picture that much (sorry for the low quality, it's still really shiny), but it's definitely obvious in the detail below. I've been slowly going into this expressive style in my fine arts classes lately. 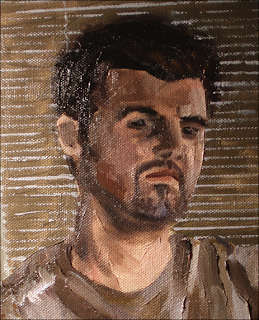 Last week I finished a portrait with two models that's got a bit of energy in it. I should have that one uploaded tomorrow if we get them back, if not it'll be Thursday. Hope everyone's not killing themselves over finals, and congrats to all that finished last week! Looks like you're making a :c face. Finished Gatsby Cover and Ducks!